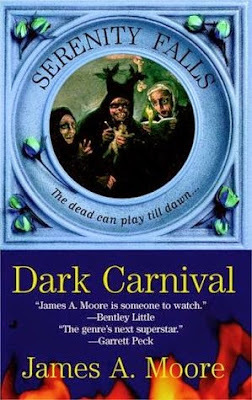 Following Writ in Blood and The Pack, the chilling Serenity Falls horror trilogy concludes with Dark Carnival. The town of Serenity Falls, New York, labors under a centuries-old curse-making no one there safe, and rendering nothing as it seems. In Dark Carnival, the circus arrives in town to raise a ruckus. But the Carnival of the Fantastic is raising more than that. It's raising the dead. No one can save Serenity Falls now-except the stranger known as the Hunter. Only he can protect the innocent from the damned. Because only he can tell them apart. As the story finally concludes, brings everything together, and the carnival comes to town (what brought me to the series in the first place), the trilogy slowly loses some steam. Action scenes are done effectively, although some of the mains I’ve come to expect play a smaller role than I figured they should. Violence still stands firm and not many are saved in this one – certainly not a classic happy ending. With this type of series and genre, that’s expected. Anything else would have been cheap and ruined the series. Having a fighter on their side who is classic anti-hero further cements this. Characters galore, as we’ve had three books now and plenty of heads to hop in, sometimes too much so. Characters are likeable enough but the shifting of viewpoint can be frustrating if indulged in too much. Since it’s obviously more of a plot-orientated story than a character driven one, I would have liked a little more complexity in it’s layers. My biggest gripe and disappointment is so much is left untold and unexplained about the mysterious Jonathan Crowley. If the series were to continue, that would be okay, but since it’s over, we’ll never find out what he is and more about him. The curse itself seems slightly aimless now, not a full circle with complete direction like I figured it would be, too much unraveling at the frays. A good, but not amazing, finish to the trilogy, it’s worth reading in its entirety.